We want so much when we need so little. But the illumined man wants for nothing. When it comes to miniature painting the old saying that `if I have seen farther than other men, it is because I have stood on the shoulders of giants` holds true to all contemporary painters. 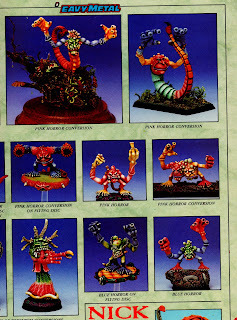 Without belttling their work or skill it was down to the painters of the 80s to apply the techniques used in 54mm painting to the then rather new 25mm fantasy miniatures that lay the foundation for todays pieces. 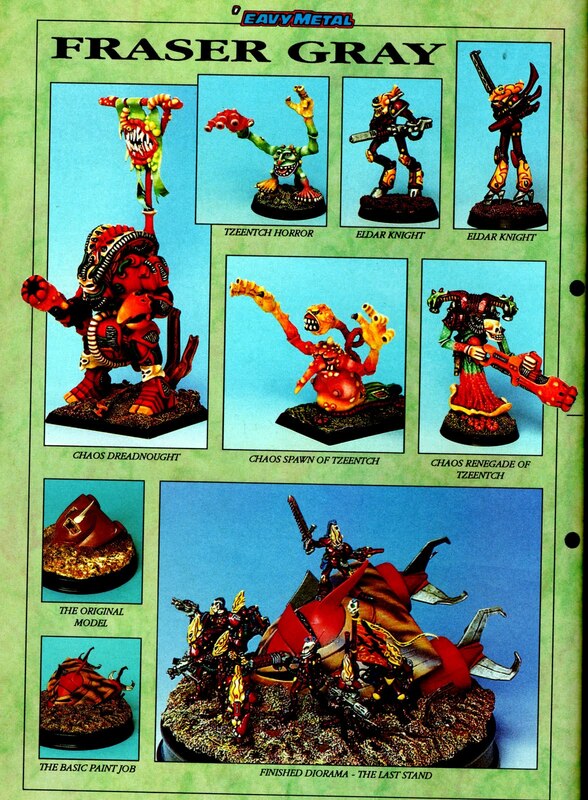 While John Blanche, the most profilic giant of times past, is still influencing the world and imagery of GW´s core systems a lot of legends of old seem to not have stepped into the digital era. There are noteable exceptions like Steve Blunt (see the blog roll) but one of the painters whose work was so much ahead of his time seems to has vanished: Fraser Gray. To get an impression of what we´re missing out today have a look at the clickable pics. Miniatures blended to perfection, sporting lucid color schems yet with a sense of realism and surreal shield and banner designs. Full froth on. Concerning the mans techniques the small snippets in eavy metal state that he used alcohol based paints which partly explains the blendings. In addition he construcued his bases out of plasticene with bits stuck in and then coated this with epoxy glue with grit sprinkled on. I cannot praise these highly enough. 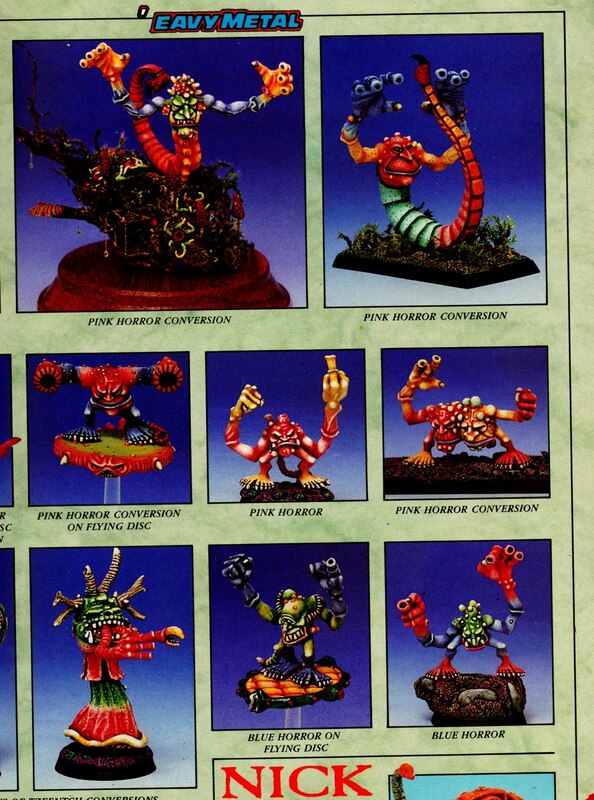 Whenever my motivation slips a glance at those pics makes me want to pick up the brush again. 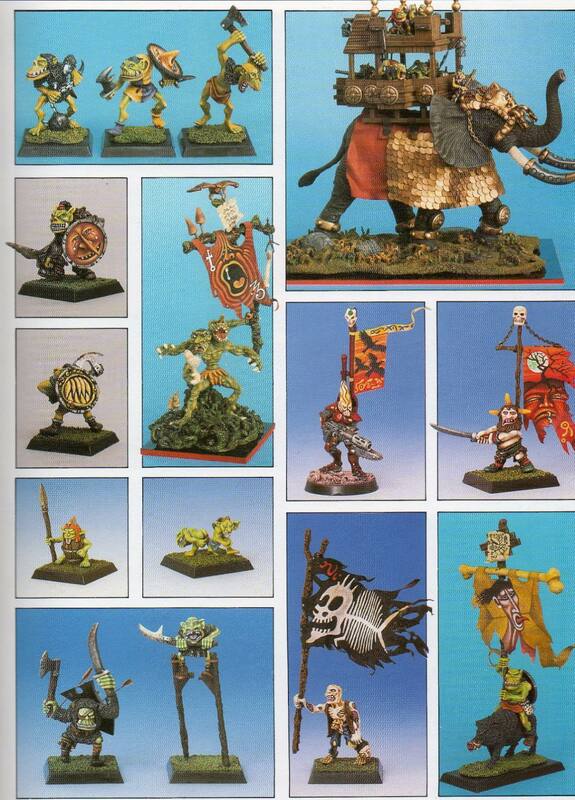 I hope that Mr. Gray is still fiddling with toy soldiers and turning them into pieces of art today. It would be even better if he could show them to us. Yes, he was very good indeed and the stuff brings back a lot of memories. 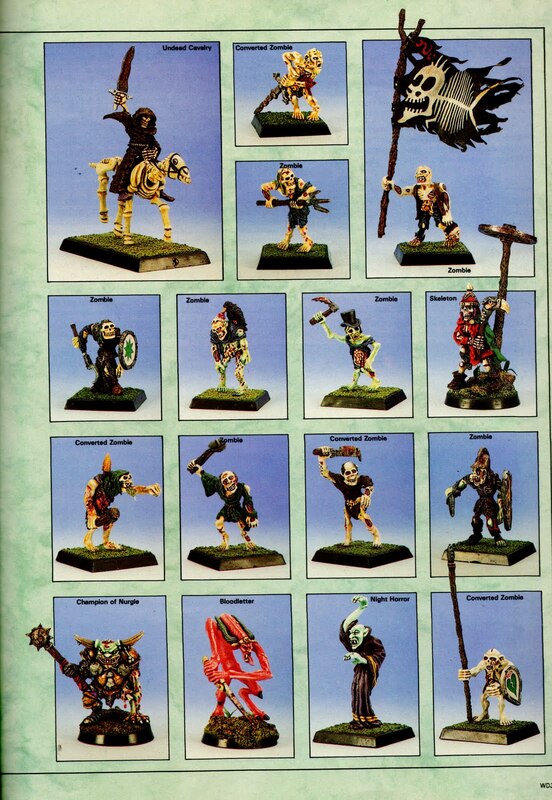 Great post, Mr Gray was my absolute favourite miniature painter back in the day. At the time his work seemed so far ahead of his contemporaries as to be almost incomprehensibly good. Looking at it now, still amazing. I wonder what he's up to now? Fraser was certainly one of the early inspirations for me in the mid eighties, his clean colours and smooth blended style being an interesting graphic counterpart to John Blanches detailed but more painter like style. 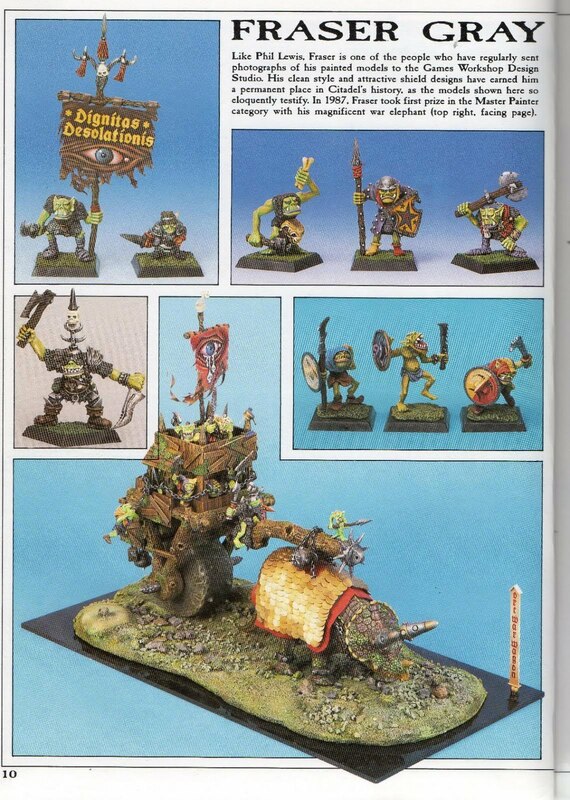 I remember chatting to him about the Orc/Elephant piece at the 1987 Golden Demon awards in Nottingham which had just won the Master’s Category ( he was already recognised then as being a bit special) and being pleasantly surprised by his use of the ubiquitous enamel paint. 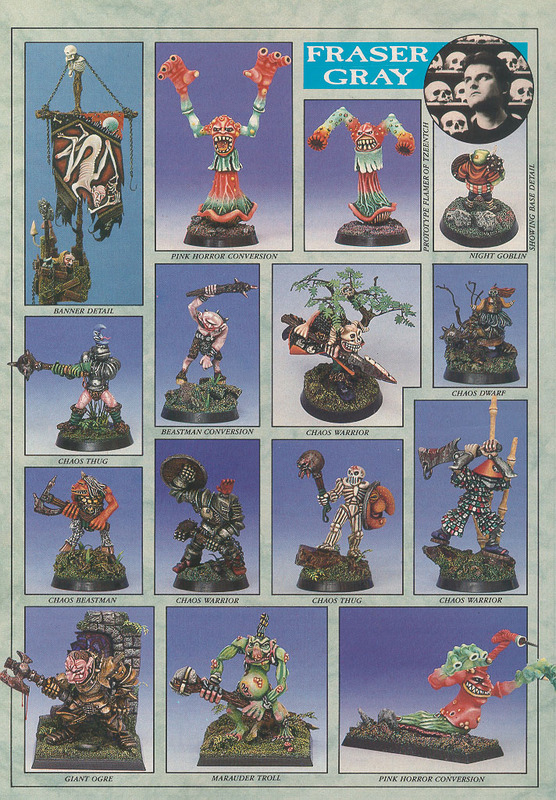 A real blast from the past!